The CEO of AT&T makes $25M+ dollars per year. Is this because of good business practices as some conservatives might call it or unfair advantages on competition? Randall made a modest salary of $1,533,333 in 2010 while also taking home an additional $25 million in stock bonuses and "other" compensation according to Forbes. Not only is this compensation outrageous but AT&T shareholders were paid out $10 billion dollars in dividends in 2010. Sounds like a huge ponzi scheme to me or a house of cards that needs to be knocked down for the sake of consumers and all Americans. Ralph de la Vega the CEO of AT&T Wireless which is a wholly owned subsidiary made $11 million dollars in 2010. I am all for big businesses exercising their right to compete in the marketplace but you have to ask yourself is their enough competition? AT&T is the top donor to Congress is paying just about every influential politician on Capital Hill and has a massively corrupt union. 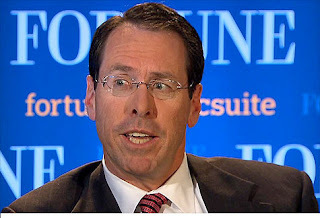 Here are the full details of Randall Stephenson's CEO compensation.